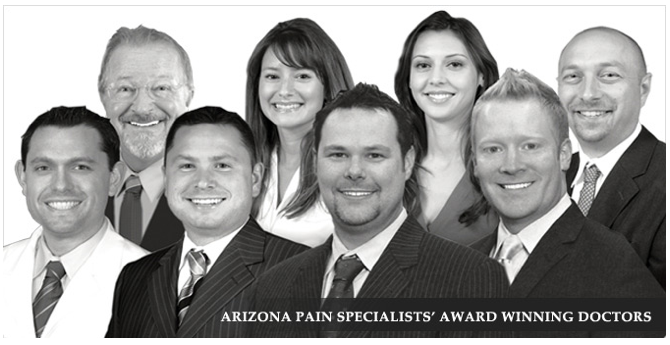 The Preferred pain clinic in Phoenix is Arizona Pain Specialists, offering Board Certified and Award Winning pain management doctors and chiropractors. With 5 locations in the greater Phoenix area, Arizona Pain is convenient and gets new patients in quickly, sometimes same day. The Phoenix pain clinics accept over 50 insurance plans along with Workers Compensation, Personal Injury and Self Pay. With a combination of options including Pain Management Procedures, Medication Management, Physical Rehabilitation, Chiropractic and Non-Surgical Spinal Decompression, patients are able to avoid surgery over 90% of the time and achieve significant pain relief! 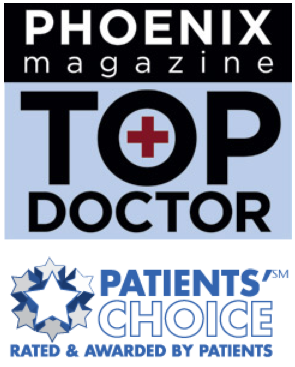 The team of Board Certified Phoenix pain management doctors and chiropractorsï¿½ have won the Patient’s Choice Award 5 years in a row! The therapies offered are individualized to each individual’s specific situation. This is why Arizona Pain has the best pain clinics in Phoenix. Arizona Pain Specialists accepts over 50 insurances at their Phoenix pain clinics including Medicare, BCBS, United, Aetna, Humana, Cigna,ï¿½ Medicaid, Personal Injury, Workers Compensation ï¿½self pay and more. Call (602) 507-6550 to schedule your Appointment TODAY! Multiple pain clinics available for treatment in theï¿½ Phoenix area serving Scottsdale, Mesa, Glendale, Tempe, Chandler,ï¿½ Queen Creek, Goodyear, Surprise, Maricopa and Casa Grande. (2813 E Camelback Road, Suite 430, Phoenix, Arizona 85016 is no longer a clinic address). Arizona Pain Specialists is a comprehensive Arizona pain management clinic serving Phoenix, Scottsdale, Glendale, Chandler, Tempe, Peoria, Gilbert, Maricopa, Queen Creek, Surprise, El Mirage, Sun City, Cave Creek, Goodyear, Litchfield, Fountain Hills, and more.